BW4473-4484 Bushings from Omega Machine & Tool Inc.
Omega Machine & Tool announces our latest bushings. 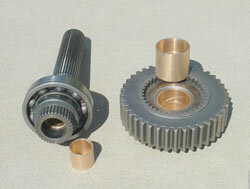 No more digging through cores to find a gear or shaft with a good bushing in it. These cases are known for having sloppy fits where the front and rear shafts fit in the case. Add to that the BW4473, BW4481, BW4482 and BW4484 transfer cases wear out the bushing in the drive gear, the pilot bushing in the end of the rear output shaft and pretty soon you have so much slop in the gear train all sorts of things start happening. Restore the transfer case to like new condition with new bushings.